#1 Saves the Traveling Time - One of the most beneficial points of Online CA classes is that it saves the traveling time. Most of the students residing in other cities or far away from the coaching institute can get benefit from these online classes. They will neither have to travel long kilometers nor have to stay away from their home. #2 Flexible Timings - Definitely, Online classes give everyone space. 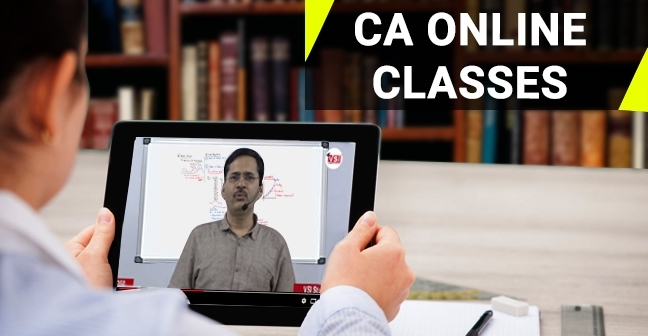 Students can enjoy CA online Classes at home and take the classes whatever time is best suitable for them. Many of the students doing a job along with the studies prefer to take the classes at night. For such kind of students, Online classes are the best rather than Live classrooms. #3 Replay the Concept - Many of the times we miss concept or could not grasp it in a single shot. You can ask the teacher to repeat the concept in face to face classes but could not ask such a thing in satellite classes. Hence, here also online classes are better where you can replay the class and understand the concept until you are not satisfied. #4 Play as per your Comfort - You can play the classes as per your comfort. You can pause it, you can replay it, you can rewind it, you can adjust its speed. Do whatever you want, no need to follow the discipline of satellite classes. #5 Forget missing the classes - Loss of missing even a single class can make it difficult to understand the whole chapter. Online CA Coaching resolves this issue by providing lectures on your demand and according to your convenience. #6 No more bother for Clashing of Classes - One of the most common problem CA students face is clashing of classes. They found themselves in a dilemma which to chose and which to lose. So, why not plan your studies with both facilities the best faculties together. Online CA classes are the best medium where you won’t have to lose anything. Why CA Online Classes from VSI ? VSI is the only institute throughout India which has given 3 AIR - 1 in IPCC and 1 AIR-1 in CA Final the past 7 years. It covers each and every concept of your course in a smart way which could not be possible for any other institute. CA Online Classes have covered past attempt questions, questions from Practice Manual, questions from study material etc. Which means that you don’t need to go through the institute (ICAI)material on your own. VSI smart compilers will also be provided to every student along with Online classes. The students will get connected on the WhatsApp group of the faculties where they can ask their doubts. All the lectures are given in simple and understandable language. Contact at VSI Jaipur and complete the registration procedure for online classes. For ordering and further information on CA Foundation Online coaching and CPT online classes, you can contact us. Join the Best CA IPCC and CA Intermediate Online Classes. Study for your CA Final at the comfort of your home by joining VSI's CA Final Online Classes. Get a chance of becoming a part of a well reputed CA Institue by taking Online VSI Classes Franchise.